Today marks the 100-year anniversary of the Balfour Declaration. Here we present an essay by Avi Shlaim that examines the declaration and its historiography. Report on the Balfour Declaration in the Times of London, 9 November 1917. via Wikimedia Commons. Today marks the 100-year anniversary of the Balfour Declaration, the statement that put the weight of the British Empire behind the establishment of a Jewish national homeland in Palestine. Bernard Regan's new history The Balfour Declaration: Empire, the Mandate and Resistance in Palestine is out now in the UK and on sale in North America on December 5. Below, we present an essay by Avi Shlaim that examines the declaration and its historiography, excerpted from Israel and Palestine: Reappraisals, Revisions, Refutations. Occasionally there are topics that have been written about at such length that it helps to clear the air, or to establish a vantage point from which to consider the subject anew. My aim therefore is to take a fresh look at the Balfour Declaration in the light of recent scholarship. I propose to focus on the Declaration itself, on the motives behind it, the way it was implemented, the conflicts to which it gave rise, and on its consequences for Britain’s position as the paramount Western power in the Middle East. I begin with a note on background. British imperialism in the Middle East during the First World War was — to use a British understatement — intricate. In 1915 Britain promised Hussein, the Sharif of Mecca, that it would support an independent Arab kingdom under his rule in return for his mounting an Arab revolt against the Ottoman Empire, Germany’s ally in the war. The promise was contained in a letter dated 24 October 1915 from Sir Henry McMahon, the British High Commissioner in Egypt, to the Sharif of Mecca in what later became known as the McMahon–Hussein correspondence. The Sharif of Mecca assumed that the promise included Palestine. In 1916 Britain reached a secret agreement with France to divide the Middle East into spheres of influence in the event of an Allied victory. Under the terms of the Sykes–Picot agreement, Palestine was to be placed under international control. In 1917 Britain issued the Balfour Declaration, promising to support the establishment of a national home for the Jewish people in Palestine. I have much pleasure in conveying to you, on behalf of His Majesty’s Government, the following declaration of sympathy which has been submitted to and approved by the Cabinet: His Majesty’s Government view with favour the establishment in Palestine of a national home for the Jewish people, and will use their best endeavours to facilitate the achievement of this object, it being clearly understood that nothing shall be done which may prejudice the civil and religious rights of existing non-Jewish communities in Palestine, or the rights and political status enjoyed by Jews in any other country. For his part, Abd al-Hadi did not believe in the possibility of cooperation with the Zionists in Palestine. He was therefore very critical in his diary of Faisal for signing an agreement on Arab–Jewish cooperation with Dr Chaim Weizmann at their meeting in Aqaba on 4 June 1919. Abd al-Hadi notes that Faisal signed the agreement without understanding its implications because it was in English, a language he did not know. But he also notes that Faisal added a hand-written codicil making the implementation of the agreement conditional on his demands concerning Arab independence being fulfilled. 9 As these conditions were not fulfilled, the agreement became null and void. There are a number of other references to the Balfour Declaration in Auni Abd al-Hadi’s diary, all of them highly critical of the British and of their Jewish protégés. His basic view, repeated on several occasions, was that the Declaration was made by an English foreigner who had no ownership of Palestine to a foreign Jew who had no right to it. 10 Palestine thus faced a double danger: from the British Mandate and from the Zionist movement. In December 1920 Abd al-Hadi participated in the Third Palestinian Congress in Haifa. The Congress denounced the actions of the British government and its plans for realising the Zionist goals. It also rejected Balfour’s promise of a national home for the Jews in Palestine as a violation of international law, of wartime Allied commitments, and of the natural rights of the inhabitants of the country. 11 In 1932 Abd al- Hadi founded the Palestinian branch of the Pan-Arab Independence Party whose manifesto called for the cancellation of the Mandate and of the Balfour Declaration. 12 Arab hostility to the Balfour Declaration, as exemplified by Auni Abd al-Hadi, could have been predicted from the beginning. So why was it issued? Th ere are two main schools of thought on the origins of the Balfour Declaration, one represented by Leonard Stein, the other by Mayir Vereté. What later became the conventional wisdom on the subject was first laid out by Stein in 1961, in his masterly survey The Balfour Declaration. 13 This book provides a careful, detailed, and subtle account of the decision-making process that led Britain to issue the Declaration, but it does not reach any clear-cut conclusions. The conclusion implicit in the narrative, however, is that it was the activity and the skill of the Zionists, and in particular of Dr Chaim Weizmann, that induced Britain to issue its famous statement of support for the Zionist cause. Stein’s book was subjected to an extended critique by Mayir Vereté of the Hebrew University of Jerusalem in a notable article he published in 1970, entitled "The Balfour Declaration and its Makers." 14 According to Vereté the Declaration was the work of hard-headed pragmatists, primarily motivated by British imperial interests in the Middle East. Far from the Zionists seeking British support, it was British officials who took the initiative in approaching the Zionists. The definition of British interests in the Middle East began in 1915, leading to the Sykes–Picot agreement which reconciled Britain’s interests with those of France, with a compromise over Palestine. On further reflection, however, the British felt that control over Palestine was necessary in order to keep France and Russia from the approaches to Egypt and the Suez Canal. In Vereté’s account, it was the desire to exclude France from Palestine, rather than sympathy for the Zionist cause, that prompted Britain to sponsor a national home for the Jewish people in Palestine. It was also thought that a Declaration favourable to the ideals of Zionism was likely to enlist the support of the Jews of America and Russia for the war effort against Germany. Finally, rumour that Germany was courting the Zionists accelerated the pace at which Britain moved towards its dramatic overture. In contrast to Stein, Vereté concludes that Zionist lobbying played a negligible part in drawing Britain towards Palestine. The historiography of the Balfour Declaration took a step forward in 2000 with the publication of Tom Segev’s book on the British Mandate in Palestine. 17 Segev’s contribution lies in the interpretation he develops of the origins of British rule in Palestine. His "revisionist account" is based on new source material as well as a new synthesis of earlier studies on the subject. In Segev’s version, the prime movers behind the Balfour Declaration were neither the Zionist leaders nor the British imperial planners, but Prime Minister David Lloyd George. In his memoirs, written some 20 years after the event, Lloyd George explained his support for the Zionist movement during the First World War as an alliance with a hugely influential political organisation whose goodwill was worth paying for. The common wisdom in Britain at the time Lloyd George published his account was that the country had erred in supporting the Zionists and that he was probably trying to justify his wartime policy. Segev will have none of it. Lloyd George’s support for Zionism, he argues, was based not on British interests but on ignorance and prejudice. In his own way Lloyd George despised the Jews, but he also feared them, and he proceeded on the basis of an absurdly inflated notion of the Zionists’ power and influence. In aligning Britain with the Zionists, he acted in the mistaken — and anti-Semitic — view that the Jews turned the wheels of history. In fact, as Segev shows, the Jews were helpless, with nothing to offer — having no influence other than that generated by the myth of clandestine power. As for the Zionists, being a minority within a minority, they could not even speak in the name of world Jewry. Lloyd George’s misconceptions about the Jews were widely shared amongst the ruling class in Britain, as was his antipathy towards the French. In Segev’s summary, the British entered Palestine to defeat the Turks; they stayed there to keep it from the French; and they gave it to the Zionists because they loved "the Jews" even as they loathed them, at once admiring and despising them. Th e British were not guided by strategic considerations and there was no orderly decision-making process. The Balfour Declaration "was the product of neither military nor diplomatic interests but of prejudice, faith, and sleight of hand. The men who sired it were Christian and Zionist and, in many cases, anti-Semitic. They believed the Jews controlled the world." 18 Britain’s belief in the mystical power of "the Jews" overrode reality, and it was on the basis of such spurious considerations that Britain took the momentous decision to sponsor the Zionist cause. 19 On one point there is a broad consensus among admirers as well as critics of the Balfour Declaration that it was a considered statement of policy, issued after prolonged deliberations, painstaking drafting and redrafting, and careful wording. Before the British government gave the Declaration to the world, it closely examined every word, and incorporated in the text countless changes and corrections. All these efforts did not, however, result in a clear or coherent text. On the contrary, they compounded its opaqueness, ambiguity and, worst of all, internal contradictions. The greatest contradiction lay in its supporting, however vaguely, the right to national self-determination of a minority of the inhabitants of Palestine while implicitly denying that right to the majority. At the time the proposed statement was under discussion in the War Cabinet, the population of Palestine was in the neighbourhood of 670,000. Of these, the Jews numbered some 60,000. The Arabs thus constituted roughly 91 per cent of the population, while the Jews accounted for 9 per cent. The proviso that "nothing shall be done which may prejudice the civil and religious rights of existing non-Jewish communities in Palestine’ implied that, in British eyes, the Arab majority had no political rights. Part of the explanation for this peculiar phraseology is that the majority of the ministers did not recognise the Palestinians as a people with legitimate national aspirations, but viewed them as a backward, Oriental, inert mass. 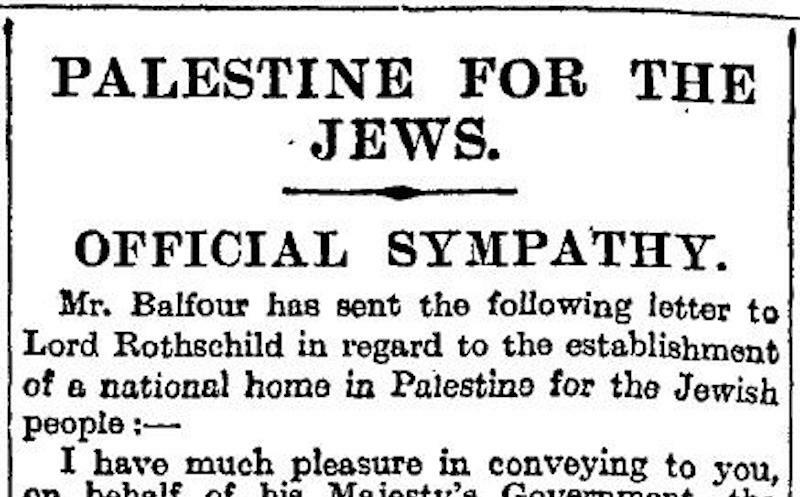 Arthur Balfour was typical of the Gentile Zionists in this respect. "Zionism, be it right or wrong, good or bad," he wrote in 1922, "is of far profounder import than the desires and prejudices of the 700,000 Arabs who now inhabit that ancient land." 20 The most charitable explanation that may be offered for this curious claim is that in an age of colonialism everyone was in some sense implicated in its ideology. Balfour may appear today like an extreme example of the colonial mentality, but he was not untypical of his era. Montagu and Curzon were overruled. The three most powerful men in the Cabinet, Lloyd George, Balfour, and Lord Milner, threw their weight behind the proposal. At the crucial meeting, on 31 October 1917, the Cabinet approved the final wording of the declaration of sympathy for a national home for the Jews in Palestine. Curzon restated his misgivings and his pessimism about the future of Palestine. Largely in deference to his anxieties, the final version of the Declaration contained the caveat about protecting the civil and religious rights of the non-Jewish communities in Palestine. 24 Chaim Weizmann was waiting outside the room where the War Cabinet met. In the early afternoon, Sir Mark Sykes emerged, calling "Dr Weizmann, it’s a boy!" The troubled and tangled history of the British Mandate in Palestine has been told many times before, recently by Joshua Sherman and Naomi Shepherd, among others. 29 Most historians of this period attribute to British policy a pro-Arab bias. Some Zionist writers go further: they accuse Britain not only of persistent partiality towards the Arabs, but of going back on its original promise to the Jews. Tom Segev makes a major contribution to the existing literature on this issue by putting Britain’s record as a mandatory power under an uncompromising lens. His verdict is that British actions considerably favoured the Zionist position and thus helped to ensure the establishment of a Jewish state. The evidence he presents of British support for the Zionist position is both rich and compelling. So is the evidence he adduces for the proposition that once the Zionist movement came to Palestine with the intention of creating a Jewish state with a Jewish majority, war was inevitable. From the start there were only two possibilities: that the Zionists would defeat the Arabs or that the Arabs would defeat the Zionists. British actions tended to weaken the Arabs and to strengthen the Zionists as the two national movements moved inexorably towards the final showdown. The Arab nationalists in Palestine, under the leadership of the Grand Mufti, Haj Amin al-Husseini, despaired of Britain and eventually threw in their lot with Nazi Germany. The Zionists, under the leadership of Chaim Weizmann, hitched a lift with the British Empire, advancing under its sponsorship to the verge of independence. The Zionists were not slow to grasp the importance for a weak national liberation movement of securing the sponsorship and support of a great power. Indeed, ensuring the support of the paramount Western power of the day remains to this day a basic tenet of Zionist foreign policy. The facts of the situation are that in the dire straits of the war, the British Government made promises to the Arabs and promises to the Jews which are inconsistent with one another and are incapable of fulfilment. The Peel Commission proposed the partition of Palestine. The logic behind partition was unassailable. It was the only solution then and it remains the only solution today to the tragic conflict between the two national movements. In 1937 the Jews accepted partition but the Arabs rejected it; so the conflict continued and the violence escalated. The Arab Rebellion of 1936–9 demonstrated once again that there could be no compromise between the two rival communities in Palestine: only war could decide the issue. The Jewish community was militarily weak and vulnerable. It would have been easily defeated had Britain not intervened to restore law and order. The Jewish national home, in the last resort, had to be defended by British bayonets. In November 1938 Major General Bernard Montgomery arrived in Palestine. His task was to crush the revolt. "Monty" was a short-tempered professional soldier with no inclination to study the details of the conflict in Palestine. He gave his men simple orders on how to handle the rebels: kill them. This is what his men did; in the process they broke the backbone of the Arab national movement. When the struggle for Palestine entered its most crucial phase, in the aftermath of the Second World War, the Jews were ready to do battle whereas the Arabs were still licking their wounds. In February 1947 the Labour government decided to hand the Mandate over Palestine to the United Nations, the League of Nations’ successor. The Mandate was relinquished because it was unworkable. All of Britain’s attempts to find a formula for peacefully reconciling the rival claims of Arabs and Jews to the country had finally failed. On 29 November 1947 the UN General Assembly voted for the partition of mandatory Palestine into two independent states, one Arab and one Jewish. The Arabs of Palestine, the Arab states, and the Arab League rejected partition as illegal, immoral, and impractical. The passage of the resolution was thus the signal for the outbreak of a vicious civil war between the two communities in Palestine, a war which was to end in a Jewish triumph and an Arab tragedy. Britain refused to assume responsibility for implementing the UN partition resolution. It set a firm date for the end of the Mandate — 14 May 1948. As the Mandate approached its inglorious end, both sides felt let down by the British, accusing them of duplicity and betrayal. The manner in which the Mandate ended was the worst blot on Britain’s entire record as the mandatory power. Britain left Palestine without an orderly transfer of power to a legitimate government. In this respect, the end of the Palestine Mandate has the dubious distinction of being unique in the annals of the British Empire. Britain’s failure in Palestine can be at least partly attributed to the Balfour Declaration, for that was the original sin. In Arabic there is a saying that something that starts crooked, remains crooked. The Balfour Declaration was not just crooked — it was a contradiction in terms. The national home it promised to the Jews was never clearly defined and there was no precedent for it in international law. On the other hand, to refer to 90 per cent of the population as "the non-Jewish communities in Palestine" was arrogant, dismissive, and even racist. It was also the worst kind of imperial double standard, implying that there was one law for the Jews, and one law for everybody else. With such a singularly inauspicious and murky beginning, British rule in Palestine was predestined to fail, as in a Greek tragedy. It was not just a policy failure, but an egregious moral failure. Britain had no moral right to promise a national home for a tiny Jewish minority in a predominantly Arab country. It did so not for altruistic reasons but for selfish and misguided ones. At no stage in this long saga did the Jews feel they were getting from their great power sponsor the support to which they felt entitled by virtue of the Balfour Declaration, and the end of the Mandate was accompanied by the most bitter recriminations. The Arabs were violently opposed to the Declaration from the start. They held Britain responsible for the loss of their patrimony to the Jewish intruders. By the end of the Mandate, there was no gratitude and no goodwill left towards Britain on either side of the Arab–Jewish divide. I can only agree with Sir John Chancellor that the Balfour Declaration was a colossal blunder — it has proved to be a catastrophe for the Palestinians and it gave rise to one of the most intense, bitter and protracted conflicts of modern times. 1. Quoted in Daphna Baram, Disenchantment: The Guardian and Israel (London: Guardian Books, 2004), p. 43. 2. Elizabeth Monroe, Britain’s Moment in the Middle East, 1914–71 (London: Chatto and Windus, 1981), p. 43. 3. Elie Kedourie, In the Anglo-Arab Labyrinth: The McMahon–Husayn Correspondence and its Interpretations, 1914–1939 (Cambridge: Cambridge University Press, 1976). 4. Isaiah Friedman, Palestine: A Twice-Promised Land? The British, the Arabs, and Zionism, 1915–1920 (New Brunswick, NJ: Transaction, 2000), vol. 1. 5. Ibid., p. xlvii; George Antonius, The Arab Awakening: The Story of the Arab National Movement (London: Khayat’s College Book Cooperative, 1938), p. 269. 6. Timothy J. Paris, Britain, the Hashemites, and Arab Rule, 1920–1925: The Sherifian Solution (London: Frank Cass, 2003), p. 44. 7. Antonius, The Arab Awakening, pp. 267–9 and 331–2. 8 Auni Abd al-Hadi, Mudhakkirat Auni Abd al-Hadi (The Memoirs of Auni Abd al-Hadi), Introduction and research by Khairieh Kasmieh (Beirut, 2002), pp. 56–7 and 292. 10. Ibid., pp. 141 and 164. 13. Leonard Stein, The Balfour Declaration (London: Vallentine, Mitchell, 1961). 14. Mayir Vereté, "The Balfour Declaration and its Makers," Middle Eastern Studies, 6 (1) (January 1970). 15. Jon Kimche, The Unromantics: The Great Powers and the Balfour Declaration (London: Weidenfeld and Nicholson, 1968), p. 69. 17. Tom Segev, One Palestine, Complete: Jews and Arabs under the British Mandate (London: Little, Brown, 2000). 21. Quoted in Margaret MacMillan, Peacemakers: The Paris Conference of 1919 and Its Attempt to End War (London: John Murray, 2001), p. 427. 22. Segev, One Palestine, Complete, p. 47. 23. Quoted in David Gilmour, "The Unregarded Prophet: Lord Curzon and the Palestine Question," Journal of Palestine Studies, 25 (3) (Spring 1996), p. 64. 25. Segev, One Palestine, Complete, pp. 116 and 142. 27. Bernard Wasserstein, The British in Palestine: The Mandatory Government and the Arab–Jewish Conflict, 1917–1929 (Oxford: Basil Blackwell, 1991, 2nd edn), p. 71. 29. A.J. Sherman, Mandate Days: British Lives in Palestine, 1918–1948 (London: Thames and Hudson, 1997); and Naomi Shepherd, Ploughing Sand: British Rule in Palestine (London: John Murray, 1999). 30. Wasserstein, The British in Palestine, p. 16. 31. Bernard Wasserstein, Herbert Samuel: A Political Life (Oxford: Clarendon Press, 1992), p. 204. 32. Segev, One Palestine, Complete, p. 155. 33. Sahar Huneidi, A Broken Trust: Herbert Samuel, Zionism and the Palestinians, 1920–1925 (London: I.B. Tauris, 2001). 34. Wasserstein, The British in Palestine, pp. 16–17. 36. Quoted in Avi Shlaim, The Politics of Partition: King Abdullah, the Zionists, and Palestine, 1921–1951 (Oxford: Oxford University Press, 1990), p. 54. 37. Segev, One Palestine, Complete, pp. 334–5. 38. Sir John R. Chancellor to Lord Stamfordham, 27 May 1930, Middle East Centre Archive, St Antony’s College, Oxford. 41. Segev, One Palestine, Complete, pp. 335–8. 42. Palestine Royal Commission, Report, Cmd. 5479, p. 370. 43. Segev, One Palestine, Complete, p. 147. 45. Edward W. Said, The Question of Palestine (New York: Vintage Books, 1979), pp. 15–16. 46. Peter Gubser, Politics and Change in Al-Karak, Jordan: A Study of a Small Arab Town in its District (Oxford: Oxford University Press, 1973), p. 22. 47. Richard Crossman, A Nation Reborn: The Israel of Weizmann, Bevin and Ben-Gurion (London: Hamish Hamilton, 1960), pp. 31–2. 48. Wm. Roger Louis, The British Empire in the Middle East: Arab Nationalism, The United States, and Postwar Imperialism, 1945–1951 (Oxford: Clarendon Press, 1984), p. 39. 49. Arnold Toynbee, "Arnold Toynbee on the Arab–Israeli Conflict," Journal of Palestine Studies, 2 (3), (Spring 1973).